"Serve as a side dish for company or family. Sophisticated enough for an event, but easy enough for a weeknight dinner. " Melt the butter and heat the olive oil in a large skillet over medium heat. Arrange the potato slices across the bottom of the skillet in a single layer. Cook without stirring for 5 minutes, or until the potatoes have begun to brown on the bottom. 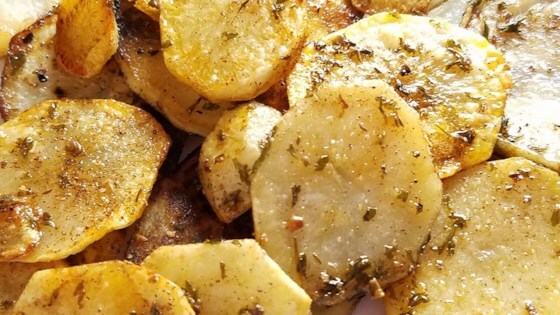 Sprinkle potato slices with rosemary, thyme, oregano, parsley, and paprika. Turn the potatoes, and continue cooking 5 minutes, or until tender. Turn off the heat, and sprinkle the garlic and cayenne over the potatoes. Lightly toss for about 1 minute, until the garlic has softened. Learn how to make red-potato mashers with garlic-flavored spreadable cheese. These potatoes turned out really well, I did cut back on the fresh herbs and used a little white pepper. I left the skin on my potato, and just used one large one (i didn't want more than one layer of potatoes in the bottom). My husband loved these. These potatoes were simple & delicious!! I had the herbs growing in my garden. They are not too "herby" Very good! Thank you for posting!